Elephants are one of the most peace-loving animals, however, sometimes when they are distressed or are disturbed, they can get very angry and wreck everything. Something similar happened when a Large Asian elephant caused chaos in Meng'a in Yunnan province of China on Sunday. 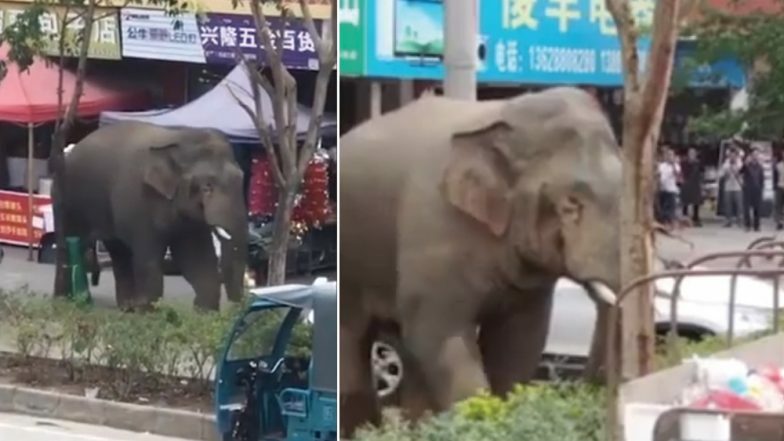 The Asian elephant reported was spotted destroying nine vehicles and damaging houses and wandered the streets and shops of Meng'a Town in south-west China's Yunnan province, as per reports by DM. Many people shot the scene on their cameras and uploaded it online. Various footages have gone viral online showing the huge mammal destroy the city. Over 20 local forestry station officers, firefighters and police officers had to come to the rescue, and after about half an hour of collective effort, the Asian elephant was taken out of the town and sent back into the forest, according to media reports. Li Wen, a wild elephant observer, said that "the animal failed to find a female to mate and was therefore in 'a bad mood,'" to Daily Mail. Take a look at the video of the elephant. The Asian elephant, also called Asiatic elephant are an endangered species and are listed as a first-class protected species in China.